This is again an recipe from my sister’s (Kavitha) kitchen. She shared this recipe with me. My mom used to make this and she makes the perfect egg korma. Recently when I was speaking to my sis and it reminded me of this curry and I couldn’t wait to make it. 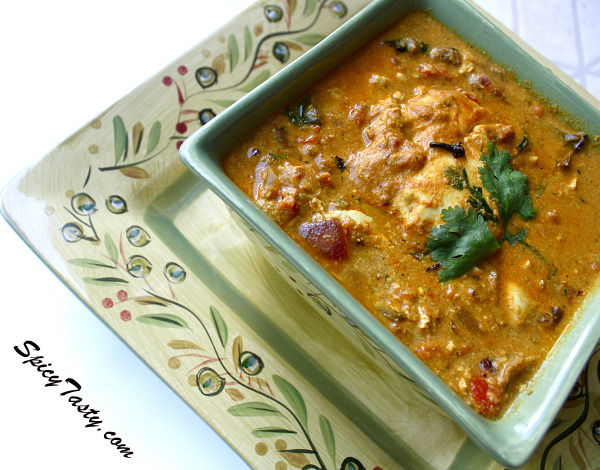 Egg korma is always easy to make and it tastes so good. The tricky part in this recipe is adding the egg in the curry. Because you shouldn’t stir the curry once you’ve added the egg. It came out very well for me. Try this recipe and lemme know how it turns out for you? Grind all the ingredients listed in the grind section into a thick paste and keep it aside. Now heat oil in a pan add cloves, cinnamon and bay leaves. Then add chopped onions and fry them till it becomes translucent and add ginger and garlic paste. Fry them for a few minutes after that add green chilies and tomato . Fry them for 2- 3 minutes and add curry leaves, turmeric powder, red chili powder and coriander powder. Mix them all together and cook in medium heat by adding a cup of water and few coriander leaves. Cook till the raw smell of masala goes off and add the ground paste. Mix well and cook in medium heat for 15- 20 minutes or till the masala smell goes off. Make sure the above gravy is cooked, and finally break each egg and drop one at a time in to the curry. Do not stir the curry, because it will break the egg. Let it sit in the heat for few minutes or until the egg becomes fully cooked. Once the egg is cooked fully remove from heat and garnish it with coriander leaves. Hmm,,,Egg Kuruma looks perfect dear makes me hungry.. Sure, it will taste good with parotta n pooris..
Wow! This is a mouth-watering korma! I’ll drink some! Lovely egg kurma. breaking raw eggs in the gravy is new but looks real yum. delicious looking gravy. Hey Shriya, this is too good! loved it! wowww looks very tempting dear!! Spicy egg korma looks really nice. thanks for dropping by Shriya. 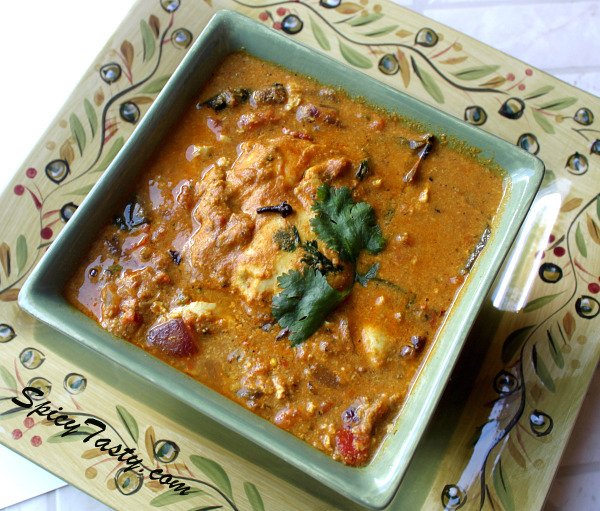 nice blog and this rich egg korma looks perfect. Interesting recipe!! Korma looks spicy and tasty. I have never tasted egg korma prepared this way. Will surely try this..
Amma makes a similar one. looks really delicious. hey the idea of dropping raw eggs in the gravy was very innovative…I used to boil the eggs before making curry..good one..but how to ensure that the eggs are really cooked? Give me Egg curry anytime, I will gladly have it. Looks delicious and perfectly done. This egg curry turned out perfect! Looks really delicious! Shriya that was lovely one…i love this curry a lot and ur version is so diff and gr8…. I do something similar to this.It really tastes very good when you break the eggs directly into the gravy.But when I do this my egg yolk turns very hard. Any suggestions? Please help. let the egg gets cooked. Thanks everyone for your valuable comments. Bookmarked! This is the first time that I see an egg curry with the eggs being added like this. I will definitely try it soon, yumyum!! This receipes looks delicious. I will try for my hubby for lunch. I tried it today and it came out totally awesome!!! the pic is really mouth watering…..
thanks 4 the recipe.. u guys r doin a great job!! My mom makes a similar curry but yours came out very well and the combination of spices was perfect. Grinding coconut and fennel along with cashews was new ,but the curry turned out excellent and everybody at home loved it. How much of cloves, cinnamon and bay leaves do I add? Hi Geetha, You can add cloves: 2, cinnamon : 1″, Bay leaves : 1. Sorry I forgot to add those measurements I’ll update the recipe. Thanks for asking. Just finished enjoying the egg curry…really good flavor! To get the eggs fully cooked, I put the lid on the pan and cooked eggs for about 3-4 minutes. Eggs were perfect! I had to add a bit more liquid to the curry as it wasn’t sauce-y enough with the one cup of water. This is my first attempt at egg curry…total success, thanks!